This doodle depicts a visual way of conceptualizing the difference between personality disorders, and how those disorders tend to line up with interpersonal styles that I’ve found really helpful. Graphic adapted from Dr Jeffrey J Magnavita’s Evidence-based treatment of personality dysfunction: Principles, methods, and processes. The powerful adjectives also made me balk, but the overall structure of the graphic was really helpful for me to understand a visual representation of how personality disorders are distributed. As a person with multiple learning styles, but a strength in visual learning, reading about personality disorders is helpful but not complete in facilitating my understanding of a deep level. This visual representation helps me understand how, for example, narcissistic is in some ways the opposite of avoidant personality disorders. Some of the feedback online was confused about the purple and yellow not having associated personality disorders. I think this might be one way to understand the structure. It is both vertical and that there are disorders at the top and the bottom but not the extreme left and right, and it is spherical in that the disorders are, I think, intentionally placed by the author near the edges. I visualize this as a well-formed personality at the exact center of the chart, and mildly pathological diagnoses just outside of the center of what could be visualized as a target. Missing from this diagram are schizotypal, obsessive-compulsive, and borderline personality disorder. 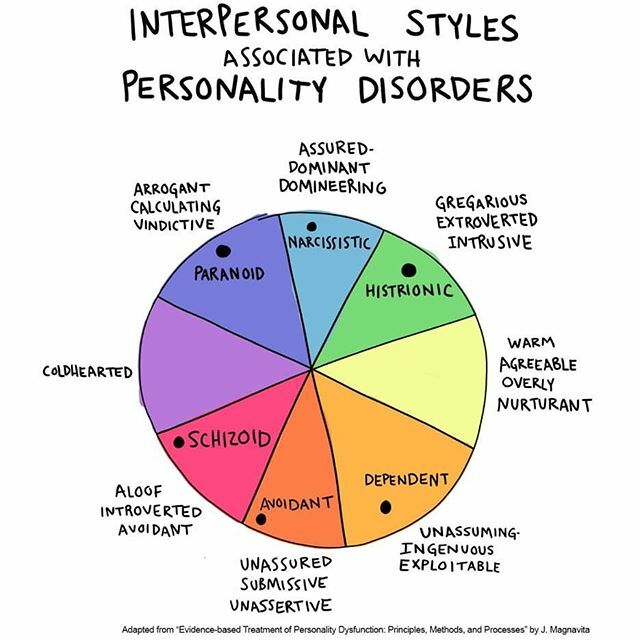 And some of the conversation around this graphic wondered if that was due to persons who experience borderline personality disorder often experiencing more than one of these personality types and/or movement between them. It can be concerning to see people sort of like this, but I’m careful to remind you that people are not their diagnosis. Diagnoses are only a part of us and when used well diagnoses help us grow self-awareness, self compassion, and empowerment. For our clinicians our diagnoses are important part of how they develop an effective treatment plan. Graphics like this can help clinicians who are visual learners, such as myself, understand and organize pathologies in such a way that they are better able to assess and help potential clients.